Curtis Family ছবি. . Wallpaper and background images in the দ্যা আউটসাইডার club tagged: the outsiders ponyboy sodapop darry. This দ্যা আউটসাইডার photo contains প্রতিকৃতি, ধনু, and চতুর. There might also be ত্বক, skintone, নগ্ন রঙ্গিন, আংশিক নগ্নতা, and উহ্য নগ্নতা. i feel lyke im gonna puke!!! lyke seriously darry is twenty something, tht guy looks like he's thrity!!!! and the book said sodapop is a doll, to me he looks more like a rag doll!!! Ponyboy looks kinda cuite but not lyke i pictured him in the book! tht is sooooo messed up!!! lyke seriously!!!! I guess you didn't get the message the book was trying teach you. then what was with all the hate? in this pic they do kinda look like brothers, they have the same eyes and person who is being hateful they are all freaking hot! And Darry does look 20. AND a doll means cute not literaly like a doll. OMG!! 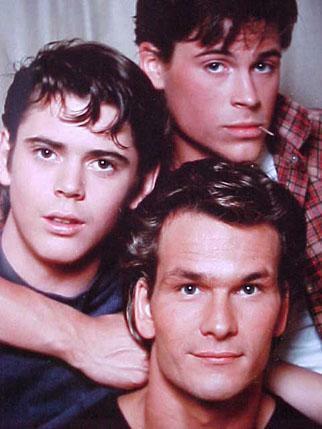 ponyboy is so flippin hot!! i like darry and soda but not as much as pony! the first sentence of the book i fell in love with him. then i saw the movie and he got hotter. but everyone is hot, but just not like ponyboy!!! The first line of the book is the BEST first line ever! I love this pic there sooooo cute! I love soda/robs face in this pic......i love his face in every pic!! The Curtis brothers look so amazing.